There are infinite variations of the single leg stand. Here are some ideas to get you started. The Tree Pose (left) is a personal favorite! 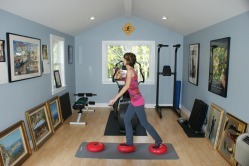 It's easy to incorporate balance exercises into your everyday activities. Balance on one leg while talking on the phone, brushing your teeth, or standing in line at the post office. Try moving your free leg forward, to the side, then back, while balancing on your standing leg, or try swinging your free leg front and back. At first you may need to hold on to the back of a chair or other stable surface, but work towards the goal of balancing on one leg without holding on to anything (including your breath -- remember to breathe while balancing!). 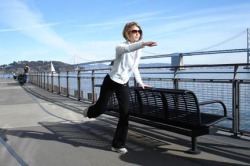 It is also important to work on maintaining your balance while moving through changes in body position (e.g., when you're walking) and when moving over unstable surfaces (grass, cobblestone). Pictured at left is what I call the "Rolling Stride." 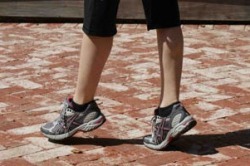 Focus on a natural stride where the heel hits first and you push off with your toes. 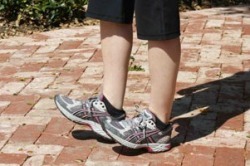 Concentrate on lifting your toes as your heel makes contact with the ground. No shuffling! ...and five steps on your heels, and repeat. This exercise is quite advanced. Try it with pillows if you don't have balance discs on hand (and let's face it: who else but a fitness instructor would have those around the house?). Start by holding on to a counter or other stable surface until you feel confident enough about your balance to go 'hands-free'.